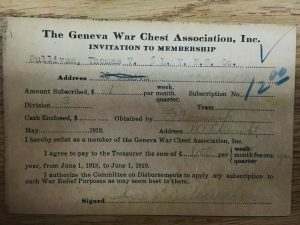 The Geneva War Chest Association, Inc. was formed shortly after the United States entered World War I. Community leaders felt that many organizations, and some con men, would be asking for money to support war-related causes. They created one organization to raise money, evaluate requests to use the money, and distribute it. In addition to news articles, the Geneva Daily Times ran ads for the fund drive. This one listed frequent excuses for not donating. The campaign was divided into teams: Manufacturers, Business, Professional, Women’s, and Clean-up. People were presented with Invitation to Membership cards, emphasizing a spirit of teamwork. Genevans were warned to only give money to solicitors with these membership cards. There was at least one report of a woman taking money in the name of the War Chest and jotting names down in a notebook. The Historical Society has all the cards from the War Chest campaign. Mrs. Stebbins made a one-time cash donation. City directories show that she was a widow, boarding with someone, so $20 may have been a large contribution for her. Mr. Sullivan pledged through the Lehigh Valley Railroad. Full participation was a point of pride for groups, from factory workers to school teachers. The 100 Per Cent List was published in the newspaper. 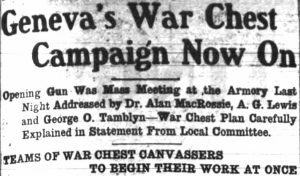 In November 1919 the Geneva Daily Times published an account of the War Chest’s activities. Like many fund drives, $150,000 was pledged but only $117,000 was collected. 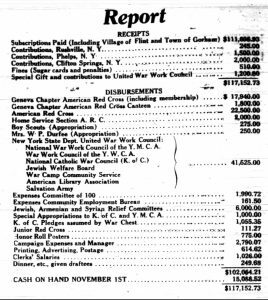 New York State had a United War Work Council which supported relief efforts, and the War Chest paid Geneva’s apportionment to that. While money went toward European relief and helping servicemen abroad, it was also spent in Geneva. Organizations supported local families whose breadwinners – a predominantly male role in 1918 – were away at war. After all accounts had been settled, there was a balance of about $2,500. In 1921, with the approval of members who had paid their full pledge, the money was transferred to the Geneva Soldiers & Sailors Memorial. The Memorial Association eventually donated their funds to the Geneva Free Library, and a plaque to soldiers and sailors is still on the front of the building. While fewer than half of Genevans donated to the War Chest, others took it seriously. There may have been other problems with this employee at the Standard Optical Company, but not donating to the campaign was the last straw.